When envisioning wolves, the first image that comes to most of people’s minds is one of a large pack perched on a hillside, howling at the moon, or one of a determined, agile creature galloping through the forest in pursuit of his prey. However, Giulia Cappelli, Lead of Programs and Human Services at Wolf Connection, and her colleagues see a whole other purpose for wolves as ambassadors for their youth education and empowerment programs. Wolf Connection, an Acton, California nonprofit, was created through Teo Alfero’s passion for both youth and animals. Prior to founding the organization, Alfero had been working as a life coach for at-risk youth when he had a wolfdog puppy forced upon him by a friend. When he went searching for a mate for his new wolfdog, he came across 16 wolfdogs who had been living at a pitbull rescue after the owner of their sanctuary had passed away. Alfero decided to begin volunteering his time to take care of these animals. Through his work with the wolfdogs and youth, Alfero noticed that animals were having a positive impact on the children, making them more talkative and open. He then decided to found Wolf Connection, a youth empowerment program and wolfdog rescue center and sanctuary, in 2009. Cappelli began as a volunteer with Wolf Connection in 2010. Because of her background in counseling and her love for children and rescue animals, she immediately knew that the organization was a perfect fit and would help her fulfill her dream to work with animals and at-risk youth. “I realized that [Wolf Connection] was my dream already in action,” said Cappelli. Today, Cappelli spends her time working directly with participants, facilitating programs, and deciding on the program best suited for each participant. “I am constantly looking for a new angle to connect with the kids,” said Cappelli. The Wolf Connection pack comprises 28 wolfdogs, many of whom have backgrounds of abuse, neglect, and abandonment. The wolves tend to come from animal shelters where they are often unable to be adopted out. Because it is illegal to own wolves in most parts of the United States, the animals are quickly placed on death row in shelters and are only able to be rescued by sanctuaries such as Wolf Connection. Additionally, some of the wolves are rescued directly from families who are unable to keep them as pets. When people decide to own wolfdogs, they are often surprised to find out that these creatures have a very different level of intelligence and different behavior than a typical dog. 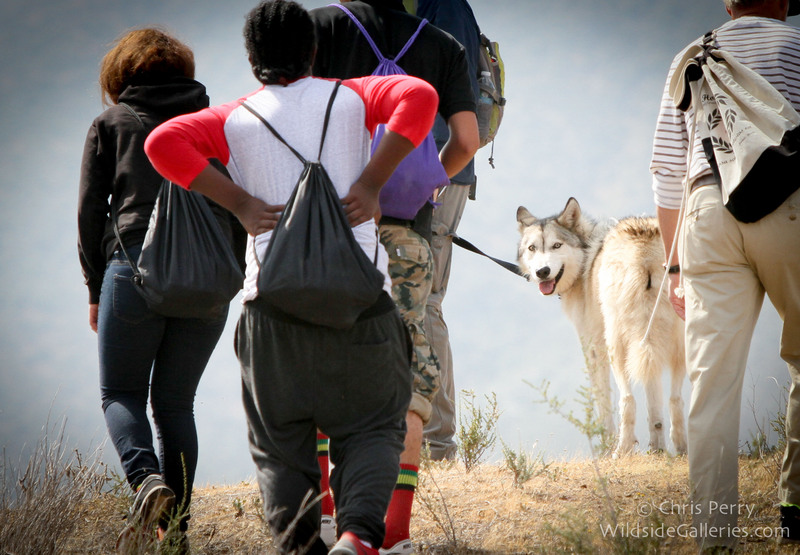 Wolfdog Ryder joins participants on a hike. “They are good wolves but bad dogs,” said Cappelli. Once at Wolf Connection, the wolves are assessed to make sure that they are suitable for human interaction. The animals spend at least one year at the sanctuary before they are ready to interact with the public and, even then, they only visit with small groups. Unlike most dogs used for therapy work, the wolves do not undergo extensive obedience training. 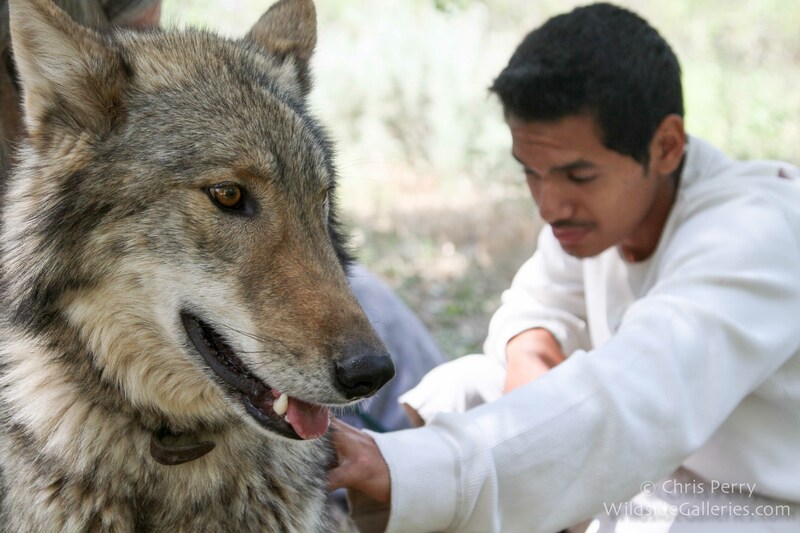 They are not taught to perform tricks or complete many commands besides “sit.” Instead, the wolves are assessed and invited to bond with staff and volunteers so that they will be comfortable connecting with program participants in a safe way. “The training is in the human-animal bond,” said Cappelli. Wolf Connection’s main goal is to provide programs for at-risk youth from the Los Angeles area. Cappelli defines “at-risk” as anyone who is disconnected from their primal self and in need of empowerment. Through Wolf Connection’s eight week program, participants learn about wolves and nature and interact with the wolves in a variety of settings. Many of the organization’s participants come from inner city middle schools and high schools or alternative high schools that serve students who have been expelled from other schools or have recently been released from jail. Many of these students have difficult pasts full of trauma and are in need of empowerment. With similar experiences with abuse and neglect, the youth and wolves share a special connection and are able to help one another heal and learn to love and trust again. In addition to the programs for at-risk youth, Wolf Connection also offers monthly hikes with the wolves for the public. After completing a hike, guests are invited to share in a potluck and take a tour of the organization’s facility. This engagement with the wolves and Wolf Connection encourages awareness throughout the community and inspires people to take the time to enjoy nature and become more in touch with their primal roots. Participants experience a special connection with the wolfdogs.Since wolves live in the moment, constantly thinking and considering their next move, their behavior can be uniquely observed and learned from by humans. The Wolf Connection participants watch how the animals, with varying degrees of anxiety, react to changes in their environment and are then able to become more aware of their own anxiety and actions. Cappelli believes that people often act out or lose motivation and self-awareness because they are disconnected with the core of their existence and being. When participants first arrive at Wolf Connection, they are curious about what it is like to be around a wolf. This curiosity opens them up to take advantage of the opportunities that the organization has to offer. Cappelli is continually amazed when watching people progress from having pre-conceived notions and being concerned if the wolves will like them to just being present and in touch with nature. Through the Wolf Connection programs, participants learn to assess whether or not they are satisfied with themselves and are challenged to focus on how their behavior and outlook affect their environment and how they are treated by others. Interacting with the wolves helps people get back to their connection with nature, animals, and themselves. Additionally, while visiting Wolf Connection, participants learn about the wolf pack dynamic in order to strengthen their relationships with others. In the wild, the wolf pack requires a certain amount of planning and collaboration in order to successfully complete a hunt. Even though the wolves at Wolf Connection are individuals and do not function as a pack, they still come together and howl as one pack, illustrating a unique level of instinctual collaboration. Participants can learn from this and become more aware of how to effectively work as a contributing member of a team made up of diverse individuals. In the future, Wolf Connection would like to expand to the point where they can subsidize their programs for more youth. They plan to move to a larger piece of property where they will double their rescue efforts and triple the number of participants in their programs from 500 at-risk youth per year to nearly 2,000 youth who are positively affected each year. Cappelli is excited to see what the future holds and is very satisfied with the impact that the wolves have had on both her participants and herself thus far. “Working with these animals has changed my life,” said Cappelli. To learn more about Wolf Connection and Giulia Cappelli, visit their website.